Our endothelial biology group is investigating the molecular mechanisms underlying endothelial dysfunction and injury in acute and chronic kidney disease. We are also interested in the interactions between endothelial cells and adjacent cells. The Breyer lab is studying the role of prostaglandins in vascular physiology. The lab is interested in the role of prostaglandin effects on endothelial function, vascular tone, and hypertension. The Fogo laboratory studies mechanisms of progression of kidney disease and potential regression of glomerulosclerosis. The laboratory focuses on key interactions of glomerular cells, including podocytes and endothelial cells, and the effects of the renin angiotensin system and plasminogen activator inhibitor-1 (PAI-1) on these interactions, using genetically engineered mice and cell culture. The Haase group uses state-of-the-art mouse genetics, biochemical and metabolomic approaches to investigate the role of endothelial oxygen and energy metabolism in the pathogenesis of acute and chronic renal injury. The Kon lab is investigating the effects of CKD-induced dyslipidemia on endothelial function. Specifically, the lab is focusing on mechanisms by which CKD impairs normal high density lipoprotein support of endothelial integrity. The Pozzi lab studies the contribution of integrins, transmembrane receptors for extracellular matrix components, to endothelial cell function in healthy and diseased kidneys. In particular, the lab focuses on how altered endothelial integrin singnaling contributes to glomerular disease and progression to chronic kidney kisease. 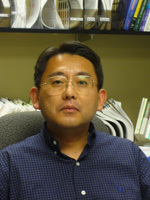 The Takahashi lab has a long standing interest in the molecular controls that are involved in renal vascular development, physiology, and pathology. The lab has been studying the role of CD148 tyrosine phosphatase in renal endothelium and demonstrated that CD148 serves as a negative regulator of growth factor signaling and inhibits glomerular endothelial cell proliferation and migration. In addition, the lab is investigating the role of eNOS in renal endothelium, especially in glomerular endothelial cells, and developing the imaging techniques that permit non-invasive assessment of renal vascular structure and function, including MRI, SPECT/PET, and microCT. The Titze lab studies how interactions between leukocytes, pro-angiogenic factors and lymphatic vessels in the skin are important for systemic blood pressure control.